Foss Bridge is a minor waterways place minor waterways place place on the waterways major waterways place village town city on the River Foss between Monk Bridge (Upper limit of navigation.) (6¼ furlongs to the northeast) and Castle Mills Bridge (2 furlongs to the south). The nearest place in the direction of Monk Bridge is Rowntree Wharf Arm; ¾ furlongs away. 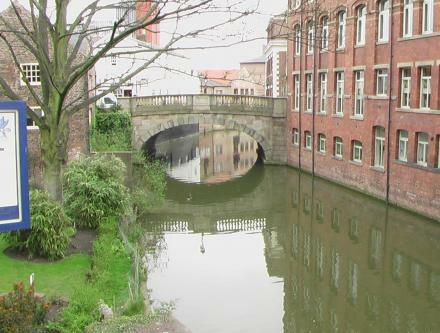 The nearest place in the direction of Castle Mills Bridge is Piccadilly Bridge, York; ¼ furlongs away. Merchantgate, York, YO1 9TU — 55 yards to the south. 11-12A Fossgate, York, YO1 9TA — 140 yards to the northwest. 1 Church Lane, York, YO1 9QT — 387 yards to the west. 23 Market Street, York, YO1 8 SL, York — 313 yards to the northwest. 4 Patrick Pool, York, YO1 8BB — 325 yards to the northwest. Coney Street, York, York, YO1 0 — 563 yards to the west. 25 Fossgate, York, YO1 9TA — 17 yards to the northeast. 3-4 Kings Square, York, YO1 8BH — 307 yards to the northwest. 6 Jubbergate, York, YO1 8RT — 292 yards to the northwest. 2 Piccadilly, York, YO1 9NU — 162 yards to the west. 14 High Ousegate, York, YO1 8RZ — 230 yards to the west. 5 Feasegate, York, York, YO1 8SH — 366 yards to the northwest. 4 King Street, York, YO1 9SP — 278 yards to the west. Station Rise, York, YO1 6HT — 791 yards to the west. 6-8 St. Helen's Square, York, YO1 8QP — 541 yards to the northwest. 46 Stonegate, York, YO1 8AS — 554 yards to the northwest. 47 Fossgate, York, YO1 9TF — 104 yards to the northwest. Silver Street, York, YO1 8RY — 267 yards to the northwest. 20b Walmgate, York, YO1 9TJ — 127 yards to the southeast. Bootham Crescent, York — 1585 yards to the northwest. York — 1090 yards to the west. 8 St Sampson Square, York, YO1 8RN — 376 yards to the northwest. 14 Goodramgate, York, YO1 7LQ — 569 yards to the north. York, YO — 177 yards to the west. 12 Walmgate, York, YO1 9 — 19 yards to the south. 31 Fossgate, York, YO1 9TA — 27 yards to the north. Shambles, City Centre, York, YO1 7LZ — 295 yards to the northwest. York — 1219 yards to the northwest. 90 Piccadilly, York, YO1 9NX — 378 yards to the south. Blossom Street 5-9, York, YO241 — 957 yards to the west. York Museums & Gallery Trust, Museum St, York, YO1 7 — 887 yards to the northwest. King's Square, York, YO1 7LD — 325 yards to the northwest. 12 Clifford Street, York, YO1 9RD — 291 yards to the west. City Wall, York, YO1 6 — 888 yards to the west. Cumberland Street, York, YO1 9 — 313 yards to the west. Paragon St, York, YO10 4NT — 565 yards to the southeast. 5 Fossgate, York, YO1 9TA — 163 yards to the northwest. 1 Tower Street, York, YO1 9WD — 240 yards to the southwest. York — 1330 yards to the west. Leeman Road, York, YO26 4XJ — 1517 yards to the northeast. Coppergate, York, YO1 9WT — 162 yards to the west. Eye of York, York, YO1 9RY — 265 yards to the south. 1A Low Ousegate, York, YO1 9QU — 369 yards to the west. 13 Swinegate Ct East, York, YO1 8AJ — 352 yards to the northwest. 22-26 Back Swinegate, York, YO1 8AD — 456 yards to the northwest. 42 Stonegate, York, YO1 8AS — 554 yards to the northwest. Tower Street, York, YO1 9SA — 270 yards to the southwest. Leeman Rd, York, YO264 — 1340 yards to the west. Museum St, York, YO1 7 — 827 yards to the northwest. City, York, YO1 — 308 yards to the northwest.